Each instance that you launch has an associated root device volume, either an Amazon EBS volume or an instance store volume. You can use block device mapping to specify additional EBS volumes or instance store volumes to attach to an instance when it's launched. You can also attach additional EBS volumes to a running instance; see Attaching an Amazon EBS Volume to an Instance. However, the only way to attach instance store volumes to an instance is to use block device mapping to attach them as the instance is launched. For more information about root device volumes, see Root Device Volume. A block device mapping defines the block devices (instance store volumes and EBS volumes) to attach to an instance. You can specify a block device mapping as part of creating an AMI so that the mapping is used by all instances launched from the AMI. Alternatively, you can specify a block device mapping when you launch an instance, so this mapping overrides the one specified in the AMI from which you launched the instance. Note that all NVMe instance store volumes supported by an instance type are automatically enumerated and assigned a device name on instance launch; including them in your block device mapping has no effect. The device name used within Amazon EC2. The block device driver for the instance assigns the actual volume name when mounting the volume. The name assigned can be different from the name that Amazon EC2 recommends. For more information, see Device Naming on Windows Instances. [Instance store volumes] The virtual device: ephemeral[0-23]. Note that the number and size of available instance store volumes for your instance varies by instance type. [NVMe instance store volumes] These volumes are automatically enumerated and assigned a device name; including them in your block device mapping has no effect. [EBS volumes] The ID of the snapshot to use to create the block device (snap-xxxxxxxx). This value is optional as long as you specify a volume size. [EBS volumes] The size of the volume, in GiB. The specified size must be greater than or equal to the size of the specified snapshot. [EBS volumes] Whether to delete the volume on instance termination (true or false). The default value is true for the root device volume and false for attached volumes. When you create an AMI, its block device mapping inherits this setting from the instance. When you launch an instance, it inherits this setting from the AMI. [EBS volumes] The volume type, which can be gp2 for General Purpose SSD, io1 for Provisioned IOPS SSD, st1 for Throughput Optimized HDD, sc1 for Cold HDD, or standard for Magnetic. The default value is gp2 in the Amazon EC2 console, and standard in the AWS SDKs and the AWS CLI. There are several caveats to consider when launching instances with AMIs that have instance store volumes in their block device mappings. Some instance types include more instance store volumes than others, and some instance types contain no instance store volumes at all. If your instance type supports one instance store volume, and your AMI has mappings for two instance store volumes, then the instance launches with one instance store volume. Instance store volumes can only be mapped at launch time. You cannot stop an instance without instance store volumes (such as the t2.micro), change the instance to a type that supports instance store volumes, and then restart the instance with instance store volumes. However, you can create an AMI from the instance and launch it on an instance type that supports instance store volumes, and map those instance store volumes to the instance. If you launch an instance with instance store volumes mapped, and then stop the instance and change it to an instance type with fewer instance store volumes and restart it, the instance store volume mappings from the initial launch still show up in the instance metadata. However, only the maximum number of supported instance store volumes for that instance type are available to the instance. When an instance is stopped, all data on the instance store volumes is lost. Depending on instance store capacity at launch time, M3 instances may ignore AMI instance store block device mappings at launch unless they are specified at launch. You should specify instance store block device mappings at launch time, even if the AMI you are launching has the instance store volumes mapped in the AMI, to ensure that the instance store volumes are available when the instance launches. This figure shows an example block device mapping for an EBS-backed instance. It maps /dev/sdb to ephemeral0 and maps two EBS volumes, one to /dev/sdh and the other to /dev/sdj. It also shows the EBS volume that is the root device volume, /dev/sda1. Note that this example block device mapping is used in the example commands and APIs in this topic. You can find example commands and APIs that create block device mappings in Specifying a Block Device Mapping for an AMI and Updating the Block Device Mapping when Launching an Instance. 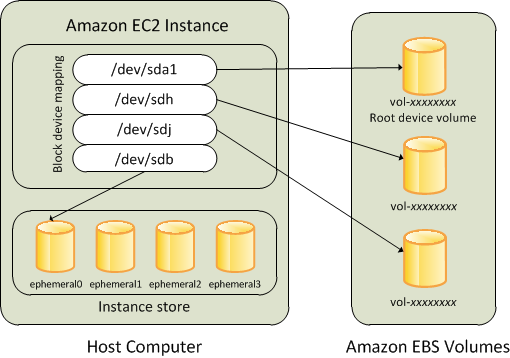 Device names like /dev/sdh and xvdh are used by Amazon EC2 to describe block devices. The block device mapping is used by Amazon EC2 to specify the block devices to attach to an EC2 instance. After a block device is attached to an instance, it must be mounted by the operating system before you can access the storage device. When a block device is detached from an instance, it is unmounted by the operating system and you can no longer access the storage device. With a Windows instance, the device names specified in the block device mapping are mapped to their corresponding block devices when the instance first boots, and then the Ec2Config service initializes and mounts the drives. The root device volume is mounted as C:\. The instance store volumes are mounted as Z:\, Y:\, and so on. When an EBS volume is mounted, it can be mounted using any available drive letter. However, you can configure how the Ec2Config Service assigns drive letters to EBS volumes; for more information, see Configuring a Windows Instance Using the EC2Config Service. Each AMI has a block device mapping that specifies the block devices to attach to an instance when it is launched from the AMI. An AMI that Amazon provides includes a root device only. To add more block devices to an AMI, you must create your own AMI. There are two ways to specify volumes in addition to the root volume when you create an AMI. If you've already attached volumes to a running instance before you create an AMI from the instance, the block device mapping for the AMI includes those same volumes. For EBS volumes, the existing data is saved to a new snapshot, and it's this new snapshot that's specified in the block device mapping. For instance store volumes, the data is not preserved. For an EBS-backed AMI, you can add EBS volumes and instance store volumes using a block device mapping. For an instance store-backed AMI, you can add instance store volumes only by modifying the block device mapping entries in the image manifest file when registering the image. For M3 instances, you must specify instance store volumes in the block device mapping for the instance when you launch it. When you launch an M3 instance, instance store volumes specified in the block device mapping for the AMI may be ignored if they are not specified as part of the instance block device mapping. Select an instance and choose Actions, Image, Create Image. In the Create Image dialog box, choose Add New Volume. Select a volume type from the Type list and a device name from the Device list. For an EBS volume, you can optionally specify a snapshot, volume size, and volume type. Use the create-image AWS CLI command to specify a block device mapping for an EBS-backed AMI. Use the register-image AWS CLI command to specify a block device mapping for an instance store-backed AMI. You can easily enumerate the EBS volumes in the block device mapping for an AMI. Choose EBS images from the Filter list to get a list of EBS-backed AMIs. Use the describe-images (AWS CLI) command or Get-EC2Image (AWS Tools for Windows PowerShell) command to enumerate the EBS volumes in the block device mapping for an AMI. By default, an instance that you launch includes any storage devices specified in the block device mapping of the AMI from which you launched the instance. You can specify changes to the block device mapping for an instance when you launch it, and these updates overwrite or merge with the block device mapping of the AMI. For the root volume, you can only modify the following: volume size, volume type, and the Delete on Termination flag. When you modify an EBS volume, you can't decrease its size. Therefore, you must specify a snapshot whose size is equal to or greater than the size of the snapshot specified in the block device mapping of the AMI. You can add EBS volumes and instance store volumes to an instance when you launch it. Note that updating the block device mapping for an instance doesn't make a permanent change to the block device mapping of the AMI from which it was launched. On the Choose an Amazon Machine Image (AMI) page, select the AMI to use and choose Select. To change the size of the root volume, locate the Root volume under the Type column, and change its Size field. To suppress an EBS volume specified by the block device mapping of the AMI used to launch the instance, locate the volume and click its Delete icon. To add an EBS volume, choose Add New Volume, choose EBS from the Type list, and fill in the fields (Device, Snapshot, and so on). To suppress an instance store volume specified by the block device mapping of the AMI used to launch the instance, locate the volume, and choose its Delete icon. To add an instance store volume, choose Add New Volume, select Instance Store from the Type list, and select a device name from Device. Complete the remaining wizard pages, and choose Launch. Use the run-instances AWS CLI command to specify a block device mapping for an instance. To increase the size of xvdh to 300 GiB, specify the following mapping. Notice that you don't need to specify the snapshot ID for xvdh, because specifying the device name is enough to identify the volume. To attach an additional instance store volume, xvdc, specify the following mapping. If the instance type doesn't support multiple instance store volumes, this mapping has no effect. Alternatively, you can use the -BlockDeviceMapping parameter with the New-EC2Instance command (AWS Tools for Windows PowerShell). You can use the following modify-instance-attribute AWS CLI command to update the block device mapping of a running instance. Note that you do not need to stop the instance before changing this attribute. Alternatively, you can use the -BlockDeviceMapping parameter with the Edit-EC2InstanceAttribute command (AWS Tools for Windows PowerShell). You can easily enumerate the EBS volumes mapped to an instance. For instances launched before the release of the 2009-10-31 API, AWS can't display the block device mapping. You must detach and reattach the volumes so that AWS can display the block device mapping. In the search bar, type Root Device Type, and then choose EBS. This displays a list of EBS-backed instances. Use the describe-instances (AWS CLI) command or Get-EC2Instance (AWS Tools for Windows PowerShell) command to enumerate the EBS volumes in the block device mapping for an instance. NVMe instance store volumes are not included in the block device mapping. First, connect to your running instance. From the instance, use this query to get its block device mapping. The response includes the names of the block devices for the instance. For example, the output for an instance store–backed m1.small instance looks like this. The ami device is the root device as seen by the instance. The instance store volumes are named ephemeral[0-23]. The swap device is for the page file. If you've also mapped EBS volumes, they appear as ebs1, ebs2, and so on. To get details about an individual block device in the block device mapping, append its name to the previous query, as shown here. For more information, see Instance Metadata and User Data.